The publication apologizes for the posts. On Friday, January 13, around 11 am the Twitter account of Ukrainian publication ZN.ua was hacked. 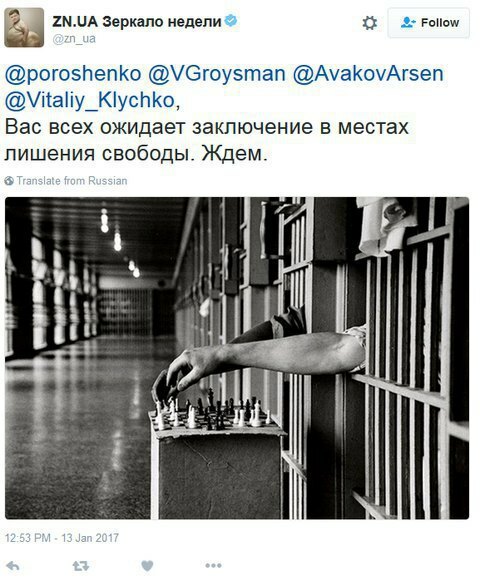 The hackers immediately posted a twit in which President Petro Poroshenko, Prime Minister Volodymyr Groysman, Interior Minister Arsen Avakov, and Kyiv mayor Vitaliy Klitschko are promises a "confinement in prison." The publication apologizes for Twitter messages published on its behalf and stated that the problem was being resolved. In August, the accounts of the Ministry of Defense of Ukraine and the National Guard on Twitter and the page of ATO on Facebook were hacked.